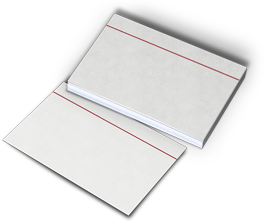 The note card system organizes research notes on 3×5 inch or 5×7 inch index cards. The system has been a staple for researchers for decades and is still recommended by researchers and instructors as a great way to organize your research notes. However, even if you do not use actual index cards, the method of organizing and sorting notes still proves useful. A research note card contains a single quote, note, or idea. Due to the physical size of index cards, there is a limit to how much you can write on on each card. But this limitation forces you to keep concise notes. The short notes make it easier to organize thoughts and outline writing. Clearly identify the source or document from which you take the note. Relating each note to a single source helps you later when it comes time to cite your sources. Try to limit your note to a specific idea or quotation. Concise notes make it easier to rely on the note cards to create outlines and organize your writing. Keywords make it easy to track the content of your note cards. When it is time to write, the key words give you ideas on how to group and organize your cards. Make it clear whether a note is paraphrasing, summarizing, quoting directly, or recording your own thoughts and analysis. Taking this action greatly reduces the chances of unintentional plagiarism. Additionally, full notes helps you gather your thoughts as you write. Just in case it wasn’t already clear: use quotation marks to protect against plagiarism. This is by far the easiest what to know when the text you see came from you or from someone else. Source cards are all about looking ahead. In this case, looking ahead to when it is time to write and cite sources. Recording bibliographical data before you start taking notes helps avoid plagiarism and saves time when it is time to compile a bibliography. Ilaro is a database for note cards. Ilaro works to combine the best parts of the note card system with the intuitiveness and power of iOS. In addition to providing note cards and source cards, Ilaro improves the note card system with additions such as cards for both authors and subjects. 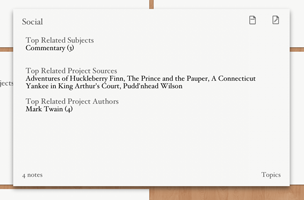 Author cards let you see, at a glance, the sources that person has authored or edited. 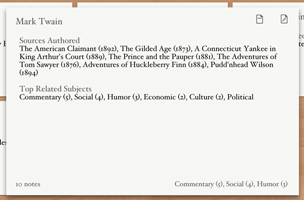 Ilaro’s author card also allows you to see which subjects you have related to that author. The card displays the relationships across all your notes in all of your projects. If you select a project, then the card displays the relationships just within the selected project. If you select more than one project, then the Ilaro author card will generate and display the combined data for every selected project! The subject card isn’t just a tag or keyword. It is much more powerful than that. As you tag notes, Ilaro tracks the changing relationships between subjects. The end result is that you can easily see how many notes you have taken on a given subject or how many times two subjects are related on the same note card. Ilaro goes a step further by letting you see which specific authors and sources are related to each subject. Future Ilaro development will enhance research workflows by adding key features for organizing note cards and moving your research to the writing process. The Craft of Research by Wayne C. Booth, Gregory G. Colomb, Joseph M. Williams. A Manual for Writers of Research Papers, Theses, and Dissertations, 7th Edition by Kate L. Turabian. The Study Guides and Strategies Website. The Learning Historical Research website by historian William Cronon.